Hmmm . . . do I spy . . . some sheep? . . . . many sheep?
. . . and many rams? 120 yowes and 48 rams?!! Yes! It’s the rams and yowes lap blanket! 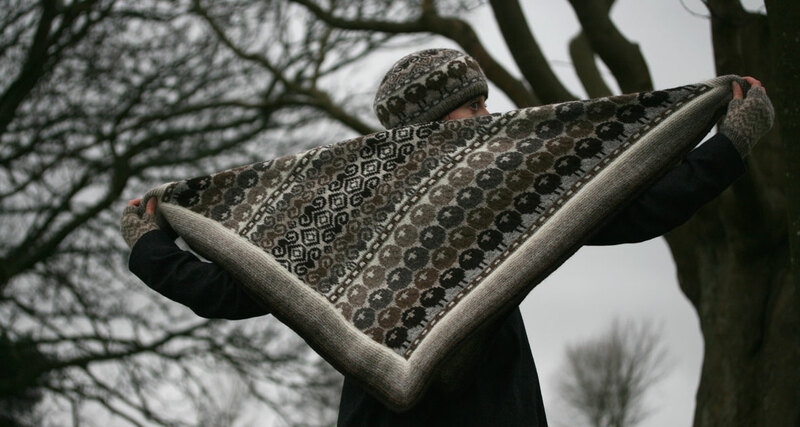 In case you were wondering, yowe means ewe in Shetland dialect and, just like the sheepheid design from which it emerged, the rams and yowes blanket is a celebration of the many-hued variety of Shetland sheep. 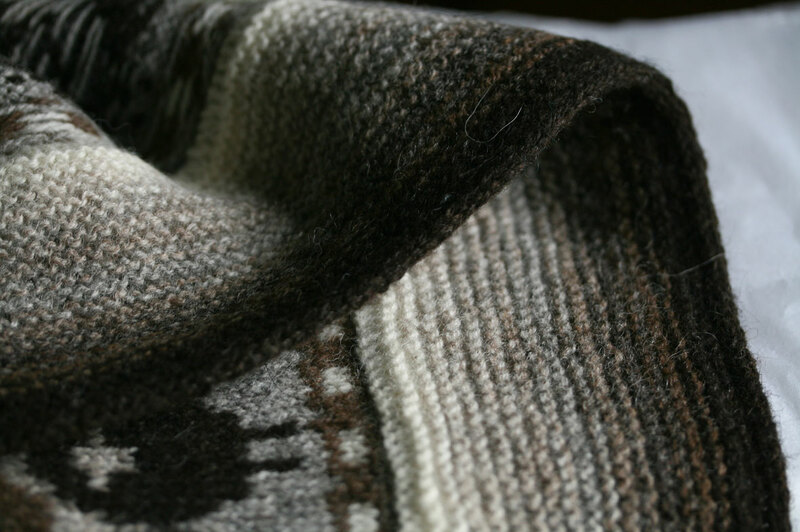 The blanket uses all 9 natural shades of Jamieson & Smith Supreme jumper weight, and it is very simple to make: the body of the blanket is first knit up as a steeked, colourwork tube. When the colourwork is complete, the steek is cut, and stitches are picked up for the garter stitch edging. Increases and decreases create mitred corners, which fold to the back of the work, creating a neat facing inside which the steek is completely hidden. If you have never steeked before, this would be a good first project to try out the technique. Here is the facing from the back with the steek hidden inside. 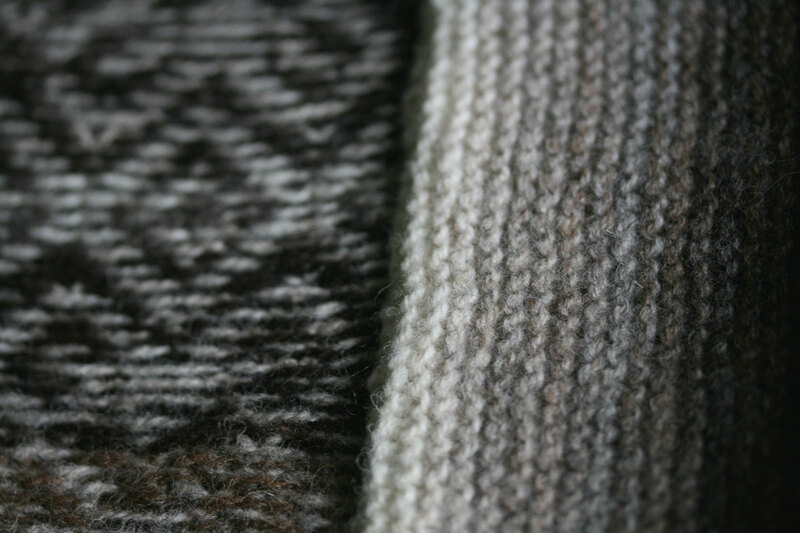 To my mind, there are few things more lovely than graded shades of natural Shetland worked in garter stitch. So very pleasing! Can you tell that I am stupidly happy with this design? The finished blanket measures 3 feet square. It is just the right size for draping over your knees, or the back of the sofa, and can also be worn as a very cosy wrap or shawl. The rams and yowes pattern has been expertly test-knitted by my friend Sarah (thankyou, Sarah!). If you’d like to make your own, the pattern is now up and available here, or here. And in case you are wondering about my hand wear – yes, those are a pair of Muckle Mitts that I whipped up yesterday from a lovely free pattern – a new year’s treat from (who else?) Mary Jane Mucklestone – go and download yourself a copy! This blanket is perfect in every way! From the color to the designs to the size. Well done Kate! Oh will you Shut the Front Door!!!!! 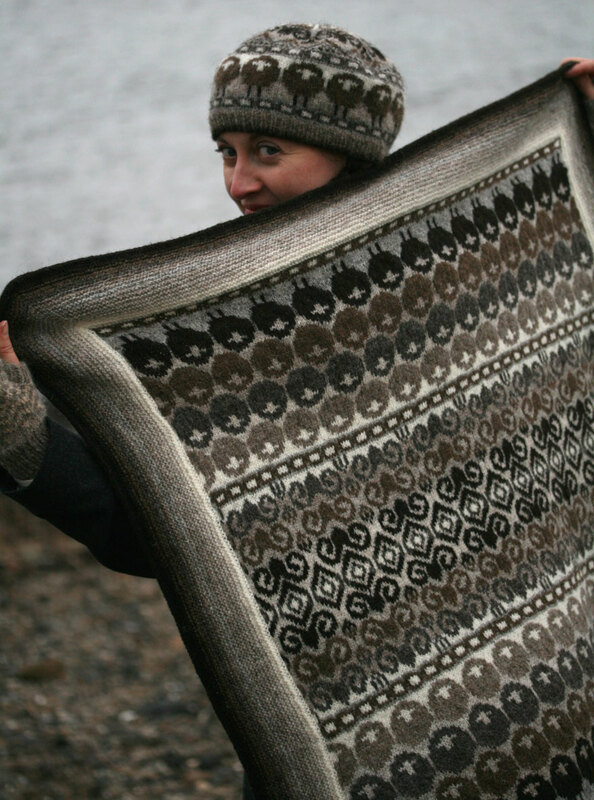 I LOVE this blanket and how cool that you have done it with a steek! I have been trying to get the courage to do that and now I have the perfect excuse :-) I was going to make your sheepheid but as I am in the tropics it would have been only worn a few times a year and then I would have to put it away :-( …. but this blanket, now that is totally different, it can be on view all year round. Looks like I will be ordering more wool for this :-) Thank you Kate! Stop it! Kate this is ridiculous. It’s just too beautiful! You’ve taken my breathe away. That is absolutely stunning! …and it just went into my Ravelry faves for purchase once I get home. I’m sorry you had a rough year, & I hope in 2012 things will be looking up. This is incredibly beautiful – a work of art!!! Amazing design of your rams and yowes, truly a beautiful heirloom; I can think of so many people around here who would adore this blanket, but if I was to knit it, I could not part with it. That is STUNNING. Wow. Wow. Where I’m from (south-east Ireland) we also say ‘yow’ for ewe. I love it! I really like the natural shades, so gorgeous. Had to add that I actually dreamed about this blanket last night. that kills me, Jessica! your subconscious is much like mine . . .
my god – it’s incredibly gorgeous! I’m now starting Owls sweater, which looks to be quick, and putting a deep think on attempting this. It will be very hard to resist! I just finished a blanket and this is next on my agenda, great timing. So beautiful! Keeping my eyes open for the kit. First I squeaked, then I fainted dead away when I saw this blanket, it is sooooo gorgeous. I queued it immediately and have promised myself that even though I’m on a stashbust for the entire 2012 I WILL make this blanket. Thank you for such a beautiful design. Hello Kate ~ found your fabulous blog this morning! Your rams and yowes pattern is amazing …you are so talented. I ♥ your lab Bruce! What a sweetheart he is. Thanks for the link to the Muckle Mitts. Looking forward to stopping by again. I love everything about this blanket. Maybe after 30+ years of knitting I will knit my very first blanket. You are an inspiration. lovely pattern! Is a pattern available for your hat in the photos? Love love love this pattern. You are brilliant! Wow wee….this is so incredibly beautiful. Oh my goodness – I love it. 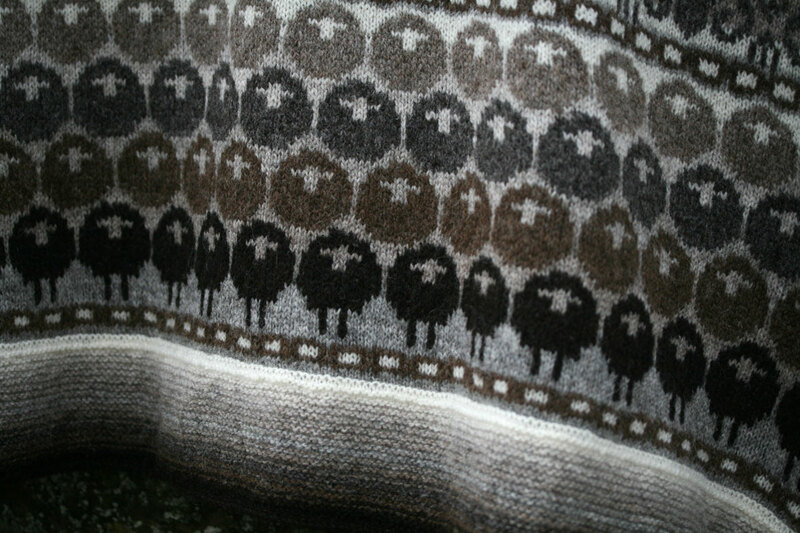 All that sheepiness in one amazing blanket. Incredibly beautiful. How long did it take you to do it? I am gobsmacked. The most beautiful thing you have ever designed. Absolutely fantastic design! The critters are adorable, made even more stunning by your incredible color palette. I can’t wait to start one! Was happily just lining up wool for the Sheep Heid . . .and now look at this: absolutely bowled over! Oh now that is the most adorable blanket! I think you should be stupidly pleased with it. It’s beautiful, and the graded fleece colours are lovely. You are a genius. I love it love it love it. So glad I found your blog, it is delicious! The blanket is truly breathtaking – gorgeous – wonderful. However, there are not enough drugs or alcohol in the world to convince me that I could ever successfully steek. Instead, I will drool with envy. Well, steeking should definitely not be attempted on drugs or alcohol! Chaos would ensue! kate, i’m happy to learn where yowe comes from! 30 years ago, when i bought my first lamb, the farmer showed me her mother, the yowe. raisin (my ewe lamb) was the first and favorite of my small flock. spencer, the farmer who sold me raisin, was a north country native. this area of northern new york has a strong scottish (and french canadian) ancestry. so that’s where my yowe came from! What a work of art. I immediately hopped over to J&S and ordered the yarn for this. It is an absolute masterpiece. You have a real gift Kate! Thanks for sharing it with us! It is the loveliest thing I’ve ever seen knitted. magnifique. I like all that you do. Beautiful blanket! I broke down this morning and ordered the SheepHeid hat kit. Now, since we own nearly 120 Shetland ewes (hmmm . . . maybe I need to count them again to make sure!) I might have to try my hand at this blanket when I’m done with the hat. Though we only own a dozen rams and not 48! 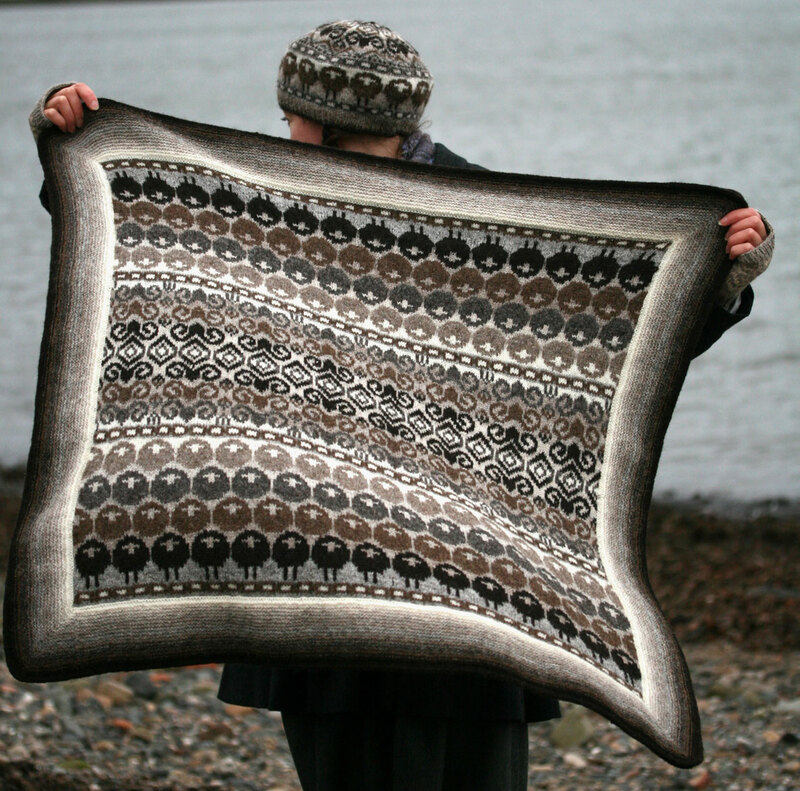 Have you ever thought about doing a katmoget patterned Shetland sheep? Or a gulmoget? Or a yuglet or other spotted Shetland? I’m soooo excited! Just purchased the yarn and pattern…..can’t wait to work on this wonderful pattern :) thank you…..
Fabulous blanket! 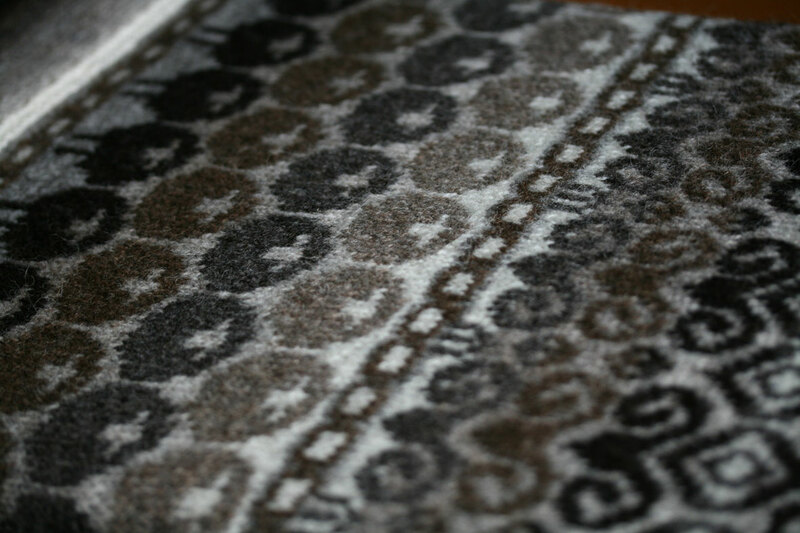 love the sheepy design and the beautiful play of colour in the natural Shetland wool. Love the blanket and hat! You are a brilliant knitter! I only could hope I’d be able to knit something so lovely! I absolutely love anything with sheep on it, and this is such a clever design. You are such a talented lady. This is definitely on my to do list!! A-MAZ-ING! I’m lost for words,… it’s completely made my day. Wonderfull ! I love it ! It’s amazing to see how the natural colors of the wool play together ! Thank you very much to show us so beautiful things ! That is gorgeous! I love the rams in the middle they are as you said like a carpet or something. The colours are fab too. Strangely enough down in the south east of Ireland where I’m from the farmers call ewes yowes too! i am constantly amazed at the beautiful designs you create. this blanket is just breathtaking. i may just have to try the dreaded steek, which just terrifies me. Love the new banner photo (!) and the design element of having some skinny ewes in the blanket. Unfortunately, my colorwork skills are nil, so this must go on the wishlist for now. ‘I whipped up yesterday’ !!! Do you ever sleep, woman? That blankie is just fabulous – I particularly like the natural colours – nature always does it better than anyone else – and perfectly executed knitting as always. Is that Duddingston Loch? totally, totally beautiful, and so much work! I love it! Stunning…the design idea and the colours and what expert knitting by your friend. Love it! Hi Kate–Happy New Year! I really love this and seems the perfect piece for me to practice my rudimentary colourwork skills…Will be in touch soon re: workshops! All best wishes in the meantime. love this, love the edging, love the play of background stripes, the graphic shapes of the wooleys, male and female, the gorgeousness in general of the yarn and the clever steek thing which this particular bear of very little brain finds completely mysterious and marvy. i love your work, but this might be my fave. I love this! Adorable, yet sophisticated. OMG! I’m fall in love with your designs, you’re such a talent woman! Absolutely love this little blanket….Bravo indeed!!!! Kate, I am in love with your amazing design. I bought all the yarn for this at Jamieson & Smith soon as I saw the pattern! (And I never do things that!) You are truly and amazing designer. Thank you! Merveilleux!! !Absolument merveilleux!!! Bravo…encore une fois. Not stupidly happy at all – Only a fool wouldn’t be delighted with that blanket! Especially if it were one’s own design! You know what? No matter what you knit I seem to always buy. Your work is so addictive. You are nothing short of amazing. Andy from NY. :-). Thank you making me a Ravelry Friend. WOW That has to be one of my favorite things EVER I think i will knit it as a reward for myself sometime next year. Thanks for another grand design, Kate! those little sheep are the best thing I think I have ever seen in the whole wide world! Love it! Just need to master the whole idea of colourwork first. I’ve just started on my first attempt (Tantallon), but have run into a hiccup due to somehow not picking up enough stitches from the provisional cast on. It’s in time out for the moment until I get the inner steel to find the missing stitches then undo the band to fix it. Ugh. It will happen though, because I’m itching to get started on the proper colourwork bit! LOVE IT LOVE IT LOVE IT LOVE IT LOVE IT LOVE IT LOVE IT LOVE IT LOVE IT!!! Magnifique!!! And the pictures are beautiful too. You have talent!!! it is absolutely gorgeous. this year I think I might finally have to knit one of your patterns considering how much I love them…I even already have yarn for a couple of them, so I really have no excuse at this point! Wow!! Sarah made a beautiful piece of art!! 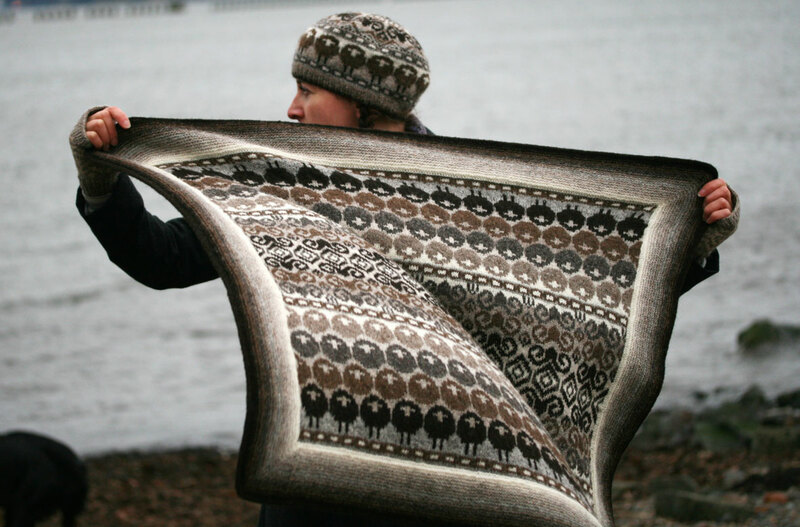 Kate, this design is absolutely stunning, I love the sheep hat too and bought the pattern some month ago, the blanket is absolutely gorgeous! Congrats and keep up the good job!!! Kate, You have every right to be “stupidly happy” with your design, it’s absolutely, incredibly beautiful!. I just bought the pattern on Ravelry, and plan on ordering the yarn as soon as I can. I second the request for a Sheepheid sweater, just the thought of it in a sweater makes me happy!! How did you figure out the color scheme, especially the background colors? Brilliant! I love how the sheep appear to be different sizes and widths when the blanket is actually in use and not lying flat. I also love how the sheep get full bodies but the rams just get heads (go girls!). I have no idea how you knit this quickly, let alone design. You were born to do this! Thank you! Oh-so-stunning and oh-so-soft looking …. many congrats on such a gorgeous thing. Kisses to you for the pattern, too! Another work of art… well done! 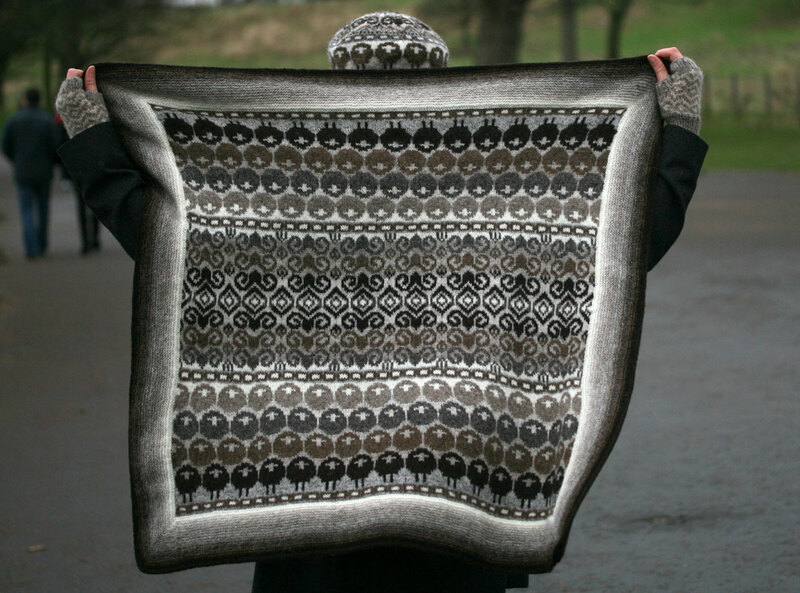 This is such a fantastic blanket – just love the perfect pairing of yarn and design. That garter stitch edging is so beautiful. That is really beautiful. I don’t know how you manage to complete such detailed projects so quickly! Well done! 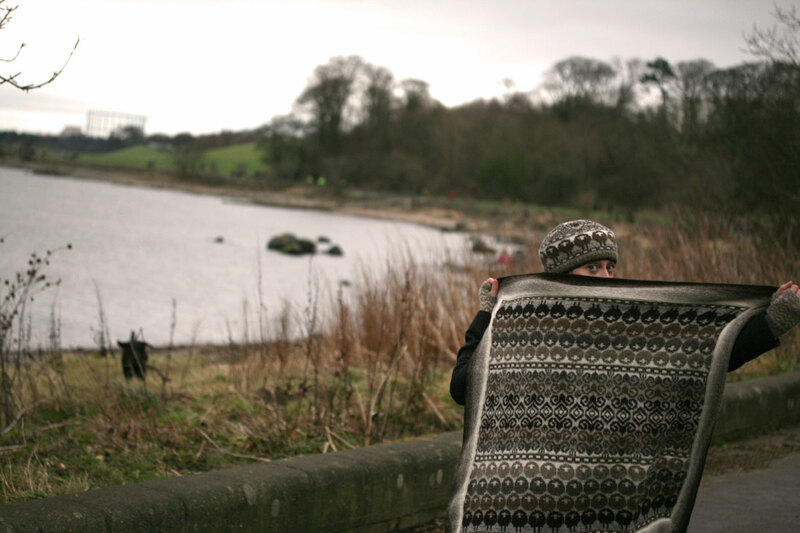 we saw you trying to put the blanket on the giant fish o’ cramond and couldn’t work out what was going on, but it all makes sense now! This is really lovely and so subtle! I think it would work as a Woolsack cushion too! Either just yows, or just rams or a few of both! Very clever Kate! Couldn’t imagine you outdoing yourself but this is…sorry don’t know what you would call it…gives me goosebumps…flips my switch…inspiration and genius rolled into one. Like the sheep I am a follower. How exciting. Hope I am still excited when I take this one on but too, too good to miss. Thanks for this amazing blanket and another great challenge that always pushes us ( me) forward another little bit…love it!! This is absolutely gorgeous! You have out done yourself, Kate! So beautiful ! I wish I could knit this blanket /wrap ! Holy cow, that’s gorgeous. I have already purchased the Sheep Heid pattern, and this is just inspirational. Gosh, you’re amazing!! This is too lovely! I badly want to knit the Boreal, so this beauty might have to wait in line. You must be an incredibly swift knitter, Kate. Wow, you never cease to amaze and inspire! It looks absolutely wonderful. Very well done! Love it, getting wool out as we speak! Love love LOVE love love. Can we please have a sheepheid sweater? Or is the world not yet ready for the amazingness? Wonderful shades. I agree with you on the garter edging, but those sheep…, so lovely! I am in love with this blankie. You are producing patterns much faster than I can knit! I love this one and can’t wait to make it. Might jump the queue after I finish Funchal. Thank you for making knitting so awesome. I love this. I’ve never steeked so I’m going to take your advice and use this as my first project. Thanks. Love this, brilliant design! Not sure my skills are up to it yet but hope to give it a try at some point. Very clever! I adore this little blanket. Fantastic! I can’t wait to tackle this one! You’ve done it again Kate. I’m in yowe of you and the blanket is totally ewesome. Beautiful work. Love it. We also call them yowes in Ireland. I love it! I did make the hat which was great fun. Hmmm, I’d better go block it so I can wear it. 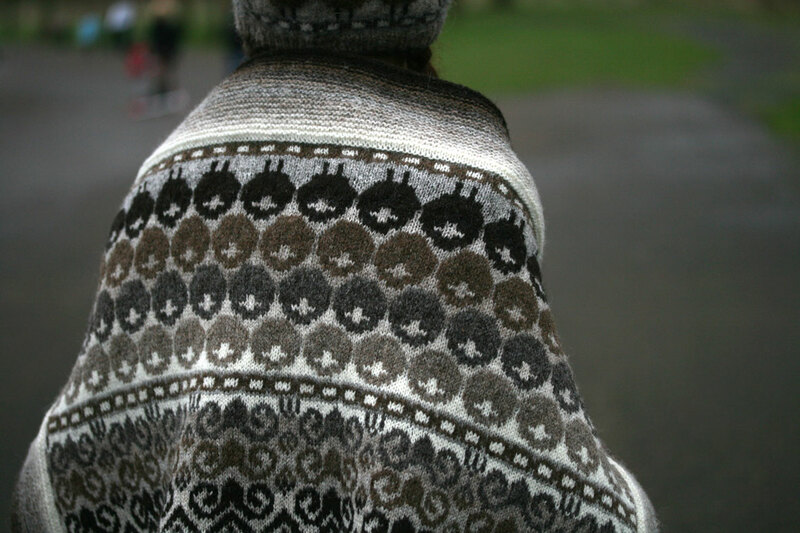 I’m going to want to knit this too but am working on your Owls sweater with some Rowan British Breeds Chunky right now. Wow, that’s amazing, love it! Wow! How incredibly beautiful. You are truly gifted! I’m inspired! I think I want a cardigan with a flock of my very own! Rams and yowes cardigan? Sign me up!! “Stupidly happy”? – no, righteously happy! That is a great blanket. The edging is a revelation – I’ve never seen garter stitch look so chic. Stunningly beautiful!! You are a gifted designer indeed!! Wow!!!!!! Gorgeous! I, too, like the the effect of the flock – almost like it is emerging from a fog! Fabulous design. I have never steeked before, but this may just be the design to make me try it! Thank you for this and all your wonderful designs, posts and photos. Happy New Year, too, to you, Tom, Jesus, and the magnificent Bruce! Oh, wow. That is lovely! Love it! 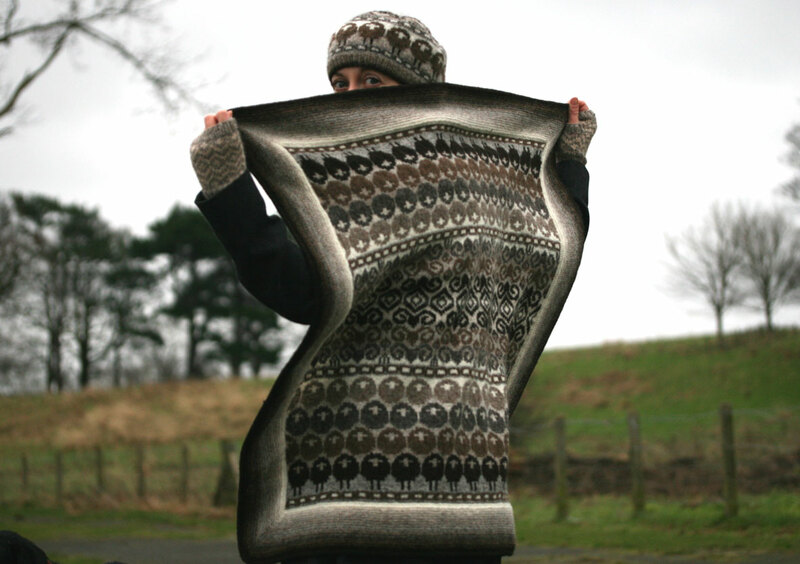 I have to download the pattern and make sure I have enough yarn for this – it is gorgeous! What fun to be curled up by the fire with this on your lap! Sheep & Rams just so lovely. Love the mitts too. You are such a busy bee. I love this! 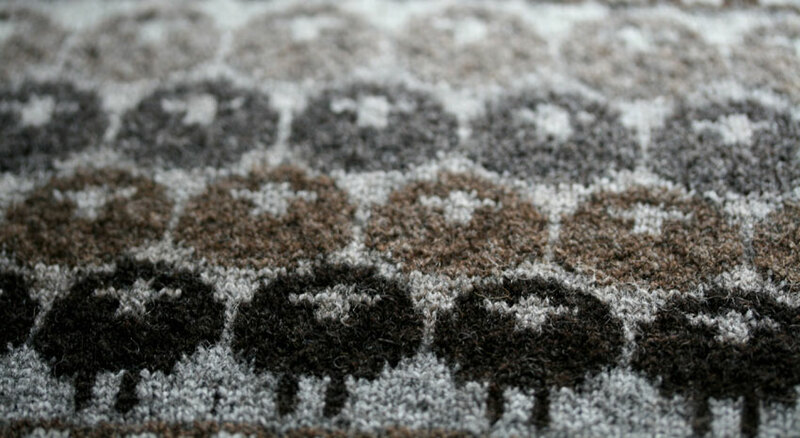 A great tribute to Shetland sheep. Yowe are so artistic! Oh my – that is so adorable. These sheep items have a life of their own. Thank you for yet another brilliant design. It’s a work of art Kate. exactly the same thing I’ve thought and said to my husband: yours are art-crafts, really, if this is not art, then what should be so called??? Wow! I inhaled so sharply at the sight of this that my husband looked up from the paper! I love the natural colours. Wow, I don’t have the patience with colourwork to attempt it but it’s utterly stunning. This is so amazing – your work is really astounding. What a beautiful, earthy design, love it! OH MY CARP. Oh my carpping CARP! This is absolutely stunning and just…oh my. I am just overcome by the natural shades, the legless yowes and all those studly, horny rams..!! I love the range of colours. Don’t they blend beautifully? Gorgeous! You are a multi-talented woman. Aaah, this is stunningly beautiful…I hold you in awe! Sue. I love sheep and adore your blanket!